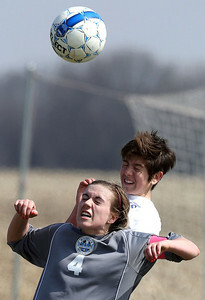 John Konstantaras-for Shaw Media Johnsburg's Shaylah Pegues (behind) and Woodstock's Kristen Schreiner (4) fight for a header during the second half of their game during the Johnsburg Soccer Tournament at Johnsburg High School Friday, April 18, 2014. The Blue Streaks won the game 3-2. 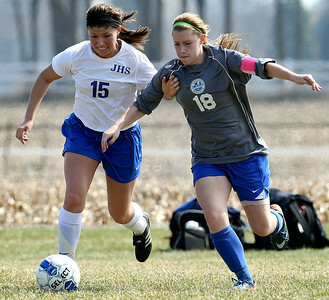 John Konstantaras-for Shaw Media Johnsburg's Tiffany Maggioncalda (15, left) and Woodstock's Anna Lopatin (18) chase down a ball during the second half of their game during the Johnsburg Soccer Tournament at Johnsburg High School Friday, April 18, 2014. The Blue Streaks won the game 3-2. 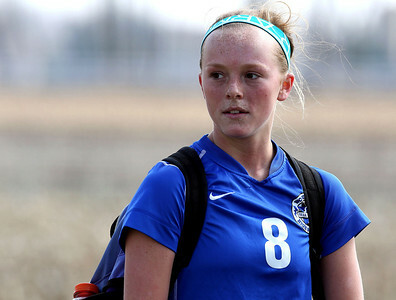 John Konstantaras-for Shaw Media Woodstock's Emma Thill (8) after their game against Johnsburg during the Johnsburg Soccer Tournament at Johnsburg High School Friday, April 18, 2014. 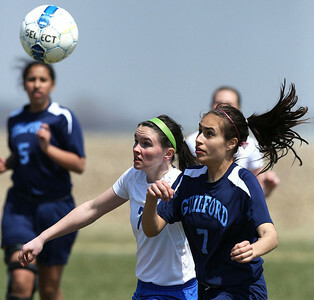 John Konstantaras-for Shaw Media Johnsburg's Shaylah Pegues (3) and Rockford Guilford's (4) fight for a ball during the second half of their game during the Johnsburg Soccer Tournament at Johnsburg High School Friday, April 18, 2014. The Skyhawks won the game 7-1. John Konstantaras-for Shaw Media Johnsburg's Shae Giovanni (7) and Rockford Guilford's (7) chase down a ball during the second half of their game during the Johnsburg Soccer Tournament at Johnsburg High School Friday, April 18, 2014. The Skyhawks won the game 7-1. 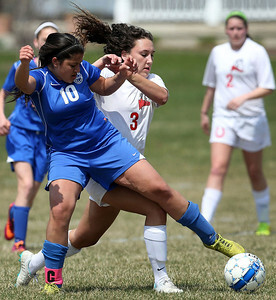 John Konstantaras-for Shaw Media Woodstock's Leiana Haanio(10) reaches across Mundelein's Michele Chernesky (3) for a ball during the first half of their game against Mundelein during the Johnsburg Soccer Tournament at the Hiller Park Field Friday, April 18, 2014. 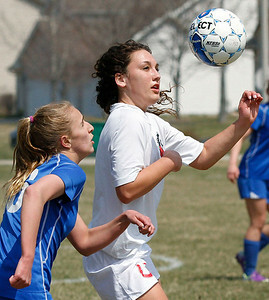 John Konstantaras-for Shaw Media Woodstock's Lizzy Kruse (16, left) and Mundelein's Michele Chernesky (3) work for position on a ball during the first half of their game during the Johnsburg Soccer Tournament at the Hiller Park Field Friday, April 18, 2014. Johnsburg's Shae Giovanni (7) and Rockford Guilford's (7) chase down a ball during the second half of their game during the Johnsburg Soccer Tournament at Johnsburg High School Friday, April 18, 2014. The Skyhawks won the game 7-1.